According to the research firm IDC, Samsung and Apple top the segment of “smart connected devices”, which encompasses computers, tablets and smartphones. The IDC report says the phone and tablets market have a strong influence on the performance of these companies, and predicts they will only get stronger in the near future. 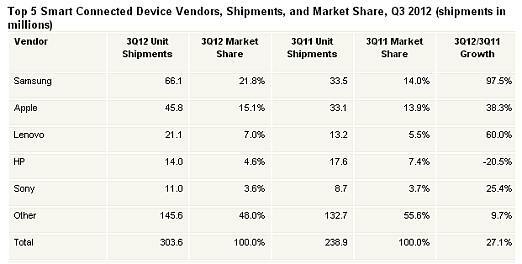 Samsung leads the race with a 21.8 percent market share while Apple has a 15.1 percent share, based on unit shipments. However, Apple led all vendors in value with $34.1 billion in quarterly sales and an average selling price of $744 across all device categories. "The battle between Samsung and Apple at the top of the smart connected device space is stronger than ever," said IDC analyst Ryan Reith. 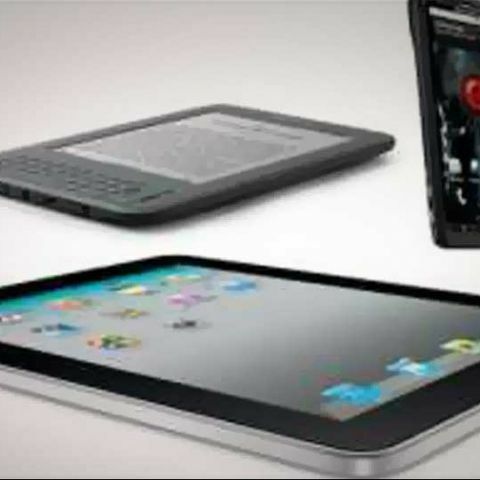 "Both vendors compete at the top of the tablet and smartphone markets. However, the difference in their collective ASPs (average selling prices) is a telling sign of different market approaches. The fact that Apple's ASP is $310 higher than Samsung's with just over 20 million fewer shipments in the quarter speaks volumes about the premium product line that Apple sells." In terms of shipments, Lenovo ranks third with 7 percent of the market, followed by Hewlett-Packard (4.6 percent), and Sony (3.6 percent). 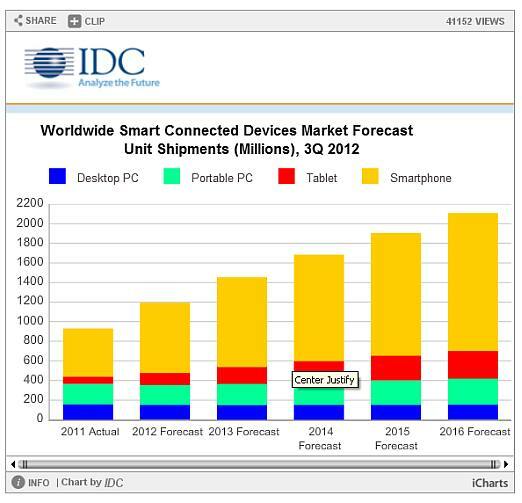 IDC predicts the global smart connected device market will reach 2.1 billion units in 2016 with a market value of $796.7 billion worldwide. Smartphones will continue to be the top product category with share rising from 53.1 percent in 2011 to 66.7 per cent in 2016 and tablets from 7.7 per cent in 2011 to 13.4 per cent in 2016. The IDC report says the third quarter sales for the smart connected devices hit fresh records, growing 27.1 percent year-on-year in the Q3 to 303.6 million units, valued at about $140.4 billion. The research firm expects the shipments will continue to hit record levels in the next quarter as well, growing 19.2 percent from the third quarter figure, 26.5 percent up as compared to the same quarter a year ago. IDC predicts sales of 362 million units with market value of $169.2 billion in the last quarter, with tablet sales growing 55.5 percent and smartphones 39.5 percent while PCs are likely to see a minor dip. "Both consumers and business workers are finding the need for multiple 'smart' devices and we expect that trend to grow for several years, especially in more developed regions," said Bob O'Donnell, program vice president, Clients and Displays. "The advent of cloud-based services is enabling people to seamlessly move from device to device, which encourages the purchase and usage of different devices for different situations." What is the apple ipad 2 USB charger price?